What are the key differences between a caravan, an off-road trailer and a motorhome? Fast fact: Always refer to your license disk on the vehicle or the original registration document where it will state what kind of leisure vehicle you are towing or driving. Below are the basic caravan, motorhome and off-road trailer classifications. A caravan is a towed vehicle and is normally heavier than an off-road trailer. A caravan usually comes standard with a pop-up roof, has fixed sides and a fold-out awning. The sleeping arrangements are typically inside the caravan. 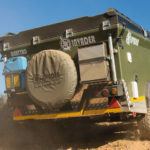 An off-road trailer is a towed vehicle and is generally fitted with a lift-up roof or fold-out tent. 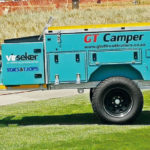 It is generally more compact than its caravan counterpart. 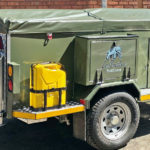 Traditionally the sides and roof of the off-road trailer are made from good quality and durable canvas and it has an outside kitchen and storage for utensils. Sleeping arrangements tend to be situated on top of the trailer in a fold-out tent. A motorhome is more easily identified and classed as having the body permanently attached to the vehicle. It has at least 2 doors and a motor to propel it, making it a standalone vehicle.